The story starts when WESLEY BOWMAN, 16, sharp and funny and defiantly individual, moves downtown from his book editor mother’s home on the Upper East Side home to live with his father and his partner for the fall term of school; Wesley, becoming a man, feels the time has come for him to more closely know (his words here) the “man from whom I did, actually, spring.” Kenny, who came out after his marriage to Wesley’s mom ended, is a much-honored gay-rights lawyer, a regular on Rachel Maddow, Charlie Rose, a frequent contributor to the Op-ed page of the New York Times. But Wesley, when he moves in, finds his father distant and inaccessible; he has much more luck connecting with his father’s partner, George, a former actor/dancer who now runs a theater district restaurant. George is present, genuinely interested, fully at ease with himself; all the things Kenny is not. He and Wesley become like father and son, really, and not because George is in any way trying to supplant Kenny. It’s just that these things happen. Then everything changes. When Wesley’s closest friend surprises him and everyone else when, after being elected class president, he comes out at the end of his acceptance speech. the two boys find themselves at the center of an act of violent, homophobic bullying (even though Wesley is straight). Within the family, tolerant facades crumble as George, suddenly, becomes suspect. Wesley’s mom values and cares for him, and has worked to have a relationship with him, as she suspects this will assure the presence of Kenny in Wesley’s life. But, now, with Wesley in the hospital being held for observation (“When did I,” she wonders, “turn into someone whose kid is held for observation?”) isn’t it her duty to wonder and worry about what might have been going on when her back was so progressively turned? Did she fail to keep her son safe? Does she, indeed, know him? Does she know George, so delightful and pleasing, an author of agreeable evenings? And, more worryingly, does this accomplished, insightful, deeply curious woman really, in the end, know herself? 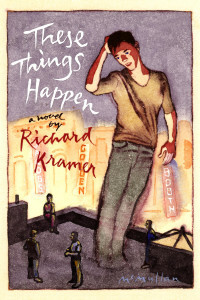 Add your review of "These Things Happen" in comments! Wow. This sounds like a great read! Thank you!